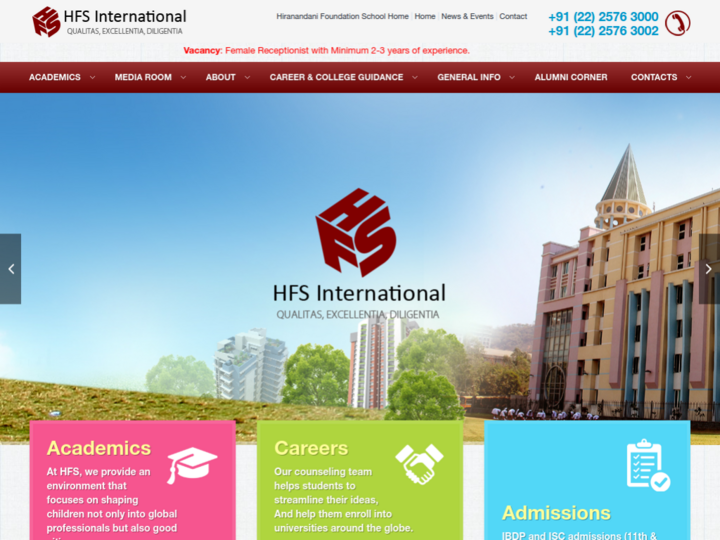 HFS International Powai,Senior School Building, Richmond Street, Hiranandani Gardens, Powai - 76,Mumbai. We believe that children have a natural inclination to learn, and hence, the best way to educate them is by tapping the latent talent of children and tuning them to achieve meaningful ends. At Hiranandani Foundation School (HFS), we provide an environment that focuses on shaping children not only into global professionals but also good citizens. The inception of HFS International from HFS took place in early 2008. At HFS International academics is not the only focus, emphasis is also laid on a number of extracurricular activities. Through vocational subjects, greater interaction and non-academic exercises, students are encouraged to develop their hidden talents.At HFS International we provide unique learning styles and imbibe the need for international standards. The engaging and thoughtful learning environment of our small classes fosters the development of the child as an enthusiastic lifelong learner.